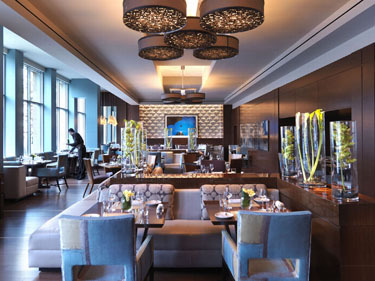 Museum quality artwork and floor-to-ceiling windows overlooking Boylston Street create a warm and welcoming environment at Mandarin Oriental, Boston's signature restaurant, Asana. Bamboo floors and a softly lit interior provide the perfect ambiance for an elegant casual dining experience whether for breakfast, brunch, lunch or dinner. Refined American cuisine and authentic Asian dishes provide a culinary journey for guests looking to enjoy seasonal New England fare with tastes of the East. Classically French trained Executive Chef Nicolas Boutin creates a menu using only the freshest ingredients. A dedicated cheese room contains international and regionally produced cheeses with an extensive wine list to complement. The exclusive Chef's Table looking into the kitchen is like none other in Boston, providing the ideal setting for an intimate gathering, celebration or private business meeting. Asana delights guests and their palates at every moment of their stay.